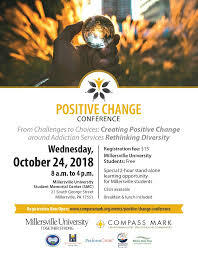 Our current addiction epidemic challenges both the skills sets and hearts of attendees, and continued engagement requires research-based interventions, as well as maximized self-care for audience members, comprising MU students, educators, probation officers, addiction and mental health counselors, social workers, prevention professionals, and others in the social service and criminal justice fields. The 2018 theme, Rethinking Diversity, asks us to our notion of diversity, both personally and as professionals. This year’s conference will offer targeted sessions to increase understanding of people from marginalized groups in our county, with the goal of enhancing compassion, trust and effectiveness of services. Attendees will also have the opportunity to do some inner research and examine their own stories, values and beliefs. Doing so moves one from the comfort circle to the risk zone a place where learning can occur and curiosity is welcome.